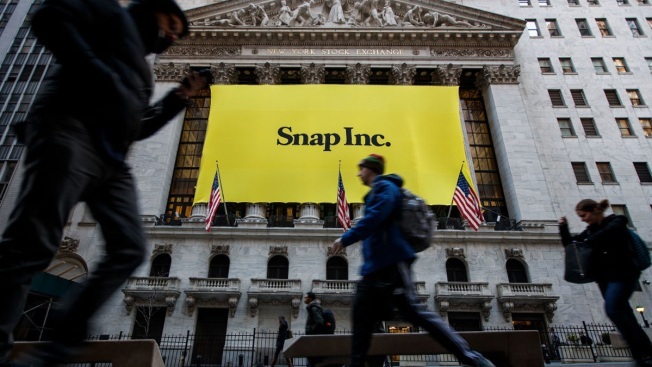 In this file photo, Signage for Snap Inc., parent company of Snapchat, adorns the front of the New York Stock Exchange, March 2, 2017 in New York City. Snap, parent company of social media site Snapchat, reported quarterly financial results for the first time on Wednesday, posting revenue that missed estimates and slower-than-expected user growth. Shares plummeted more than 19 percent in after-hours trading. Since its initial public offering in early March, Snap has faced an uphill battle to convince Wall Street it can make money with advertising, even with Facebook and Google dominating the market. While its $3.9 billion initial stock sale in early March was the largest U.S. IPO in more than two years, the company has consistently reported huge losses.